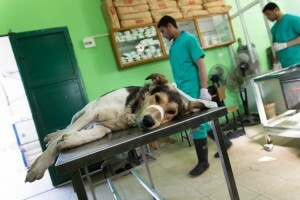 In the West Bank, the stray dog and cat population is perhaps one of the most visible animal welfare problems. While precise numbers of stray animals have not been established across the West Bank, dogs and cats in varying states of health and well-being can be seen in both built up and rural areas around the region. There is no relevant animal welfare legislation in place in the region and no established culture of neutering pets. The stray population is likely to be made up of abandoned pet animals and their offspring, escaped working animals and their offspring and, potentially, animals deliberately released into the region. Stakeholder engagement carried out by PAL with key stakeholders in 2014 and 2015 as part of this project has revealed dogs might be considered a nuisance, a danger to public health and safety and/or unclean. There is also some element of concern regarding dogs which stems from a religious and cultural perspective. For these reasons, dogs are targeted by both official (municipality-led) and unofficial (citizen-led) methods of lethal control. Cats and other animals (including family pets) do, however, become untargeted victims of indiscriminate control methods such as poisoning. In February 2016, PAL formally launched Palestine’s first ever trap, neuter, vaccinate and release (TNVR) scheme in the city of Tulkarm. This followed a detailed development programme which was carried out over the course of 12 months. Read about how the project came to fruition below, or skip straight to news about the programme’s delivery. 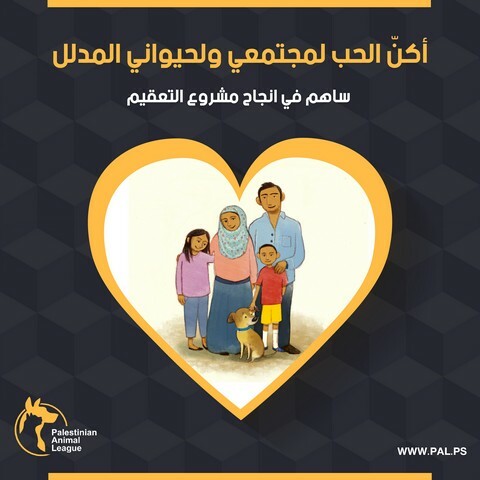 PAL has developed a Best Practice Manual and accompanying educational resources for local authorities to use to develop and implement their own TNVR programme in their local area. 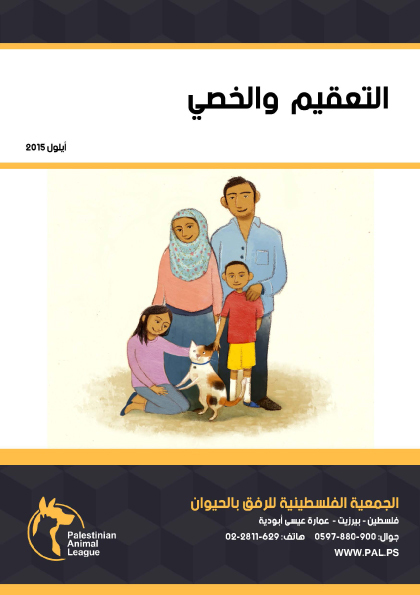 The manual and resources are available free of charge and can be downloaded below in both English and Arabic. If you are part of a local authority in Palestine and would like to work with PAL to develop tailored materials, please get in touch. We would be happy to work with you. Working in conjunction with the Al Najah University Veterinary School and the Governorate and Municipality of Tulkarm, PAL designed and developed a TNVR programme for delivery in this major Palestinian city. In August 2015, the PAL team carried out a formal census of stray dogs in the city of Tulkarm as a final step before the project’s implementation. 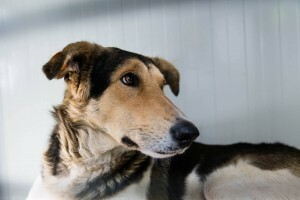 There are estimated to be at least 1,100 street dogs in need. In September 2015, thanks to generous funding from Dogs Trust, five of the PAL vet team attended specialised training in Jordan on humane trap and release protocols. This course provided the team with essential skills to ensure that animal welfare remains a top priority as the new programme is put into action. In October 2015, Dogs Trust UK generously agreed to fund the delivery of the pilot project in Tulkarm. The grant funded the construction of a dedicated preparation and recovery suite for dogs before and after surgery as well as equipment, training and public engagement activities. PAL’s “Save a Street Dog” campaign was launched at the same time in order to support the long-term delivery and expansion of the scheme following the initial pilot period. The programme was formally launched in February 2016 – you can learn about the first dog treated as part of the pilot here. The pilot will see around 240 dogs will be neutered and vaccinated. Community engagement activities will be carried out and a low-cost neutering service for pet animals will also be offered. This is the first programme of its kind in Palestine and it is hoped that the scheme can be rolled out to other major towns and cities in the coming years. After the successful completion of the pilot project in Tulkarm, PAL plans to roll out the scheme to other major Palestinian cities.  The Municipality of Ramallah has already stated interest in participating and in October 2015, PAL began talks with the Ministry of Agriculture in order to explore the opportunities to gain formal endorsement of the scheme at a national level. 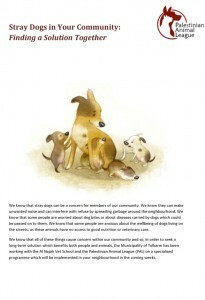 At present, because dogs are targeted by lethal control methods, PAL’s work is focused on dogs. In future, we hope to extend the programme to include cats. Read latest news for this project.